Födelsedagsflickorna deltar i följande utmaningar: Kort o Mania (Skiss), Crafting for All Seasons (Girly), Simon Says Wednesday (Girly), Bunny Zoe (For the Girls), Cupcake Inspirations (Sparkle), Penny's (One for the Girls), Fan-Tastic Tuesday (Add some ribbon) och Creative Fingers (ATG). These whimsical little girls are perfect for our challenge, Jessi, and a fun design, too! Thanks for playing along with us at the Simon Says Stamp Wednesday challenge! What fun! That Bugaboo image is so cute! Thanks so much for joining in the fun for the Cupcakes Inspirations 300th Challenge Celebration! 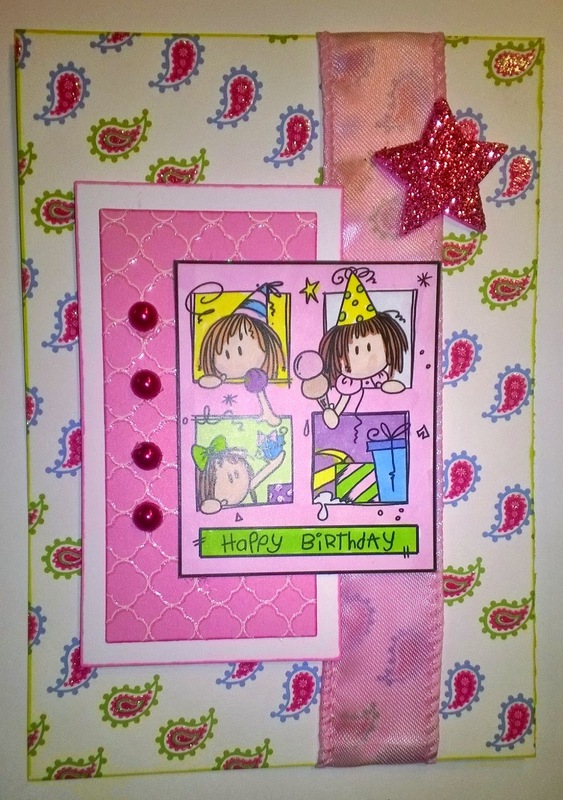 Pretty pink card. Love the Bugaboo image. Thanks for playing in our 300th Challenge at Cupcake Inspirations! Herlig søtt kort! Takk for du deltar hos k.o.m. Takk for at du deltar på utfordringen hos Kort`O`Mania. Så søtt kort, flotte farger. Takk for du er med på utfordringen her oss i Kort’O Mania.